First Church’s “Mighty Möller” pipe organ was designed primarily for the musical requirements of the church, namely the leading of congregational singing, the accompaniment of choral works, and the offering of solo organ repertoire for services of worship. The fortuitous combination of the organ’s rich, diverse tonal resources and the sanctuary’s remarkable acoustics allows the instrument to be extremely effective in recital and concert as well. It is the largest pipe organ in Long Beach, and one of the larger organs in Southern California. Mathias Peter Möller emigrated to America in 1872, at the age of eighteen, and developed his knowledge of pipe organ design and construction working for the Derrick Felgemaker Organ Company of Erie, Pennsylvania. Möller developed an innovative design for a pipe organ wind chest and soon after created his first pipe organ. In 1880, Möller located his own company in Hagerstown, Maryland, where it gained its present position of leadership in the pipe organ world. The company closed its doors for the final time in 1982. First Church’s organ was organized in seven divisions (Great, Swell, Choir, Bombarde, Positiv, Brustwerk, and Pedal) with a total of 68 ranks. The use of the various divisions makes it possible to perform appropriately music from all historical style periods. The instrument thus might be described as an “eclectic American organ” with a special affinity for the performance of French Romantic repertoire. M. P. Möller installed literally thousands of organs throughout and beyond the United States until the company’s demise. Many of these instruments were “assembly line” instruments consisting of perhaps twelve to thirty-six ranks. Most of these organs were installed in churches with small- and medium-sized congregations and were known for their reliability and cost effectiveness. First Church’s “Mighty Möller” was one of the company’s larger projects, and was reportedly one of the installations of which M. P. Möller was most proud. A series of services and recitals were held from October fourteenth through the twenty-first in 1956 to dedicate the new pipe organ and the newly renovated sanctuary. The organ continues to be a treasured musical resource of the congregation of First Church and the musical community of Long Beach. In addition to its use in worship services, it is heard in the performance of large choral works in Advent and on Palm Sunday and in other recitals and concerts throughout each year. After thirty years of constant use, consideration was given to replacing the original Möller console. 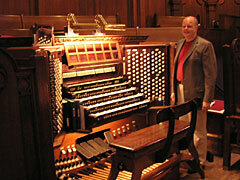 Organist Bryan Beavers began to design the new console in 1979. When Beavers died an early and sudden death in 1986, the design of the console was completed and subsequently was built as a memorial to him. The console, built by David Harris of Whittier, California, was installed in 1989. The Harris console contains five manuals, one more than on the original console. The console is prepared to support well over one hundred ranks, allowing for expansion of the chancel organ as well as development of an antiphonal or echo organ in the future. The console is currently operated through a Devtronix computer system that allows the storage of multiple levels of combination action on floppy disks as well as digital recording and playback. 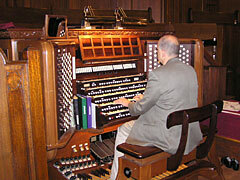 In conjunction with the development of the Harris console, two enhancements were made to the Möller organ. The Cor de Gabriel, the rank of horizontal trumpet pipes at the front of the chancel, was given by Bill Orth, a longtime member of First Church. As the largest solo reed of the organ, the visual prominence of the Cor de Gabriel is matched by an aurally impressive effect for wedding processionals and other music of a regal or ceremonial nature. The second addition to the organ was a Zimblestern given by longtime First Church member Zella Vaughan. The Zimblestern was found on many organs of the Baroque period, and then fell out of use until recently. TheZimblestern is a percussion stop utilizing a set of bells attached to a star that produce a random tinkling sound at a fairly high pitch as the star rotates. The Zimblestern resides in the Great division, high up in the central arch of the chancel. Dorothy Johnson was a much loved member of First Church who loved the organ and organ music. Following her death in 1994, memorial moneys were used to carry out a complete redesign of the Swell division. The specific changes to the Swell division included the addition of a new 4′ flute stop; the replacement of the Möller Voix Humaine with one that is more typical of the timbre preferred today; the replacement of the Swell 8′ trumpet with a new French trumpet of larger scale; the restructuring of the former Swell 8′ Trompette as a new 16′ reed for the Swell division; and, the restructuring of the former Swell 16′ Basson as the new 8′ Oboe for the Swell division. The additions to the organ bring it to its current size of seventy ranks. The Dorothy Johnson Swell Division was dedicated in an organ recital on October 20, 1996. The renovation of the Swell division was carried out by Robert L. David & Associates, Organ Builders, of West Hollywood, California. Robert L. David & Associates continue to be responsible for the maintenance of the entire organ as well as the design of future enhancements.